Access to clean water is a fundamental human need that must be met if we expect to sustain progress toward ending poverty, ensuring access to education, and improving global health standards. Engage with us to talk about the problem, to understand the problem from different perspectives, to identify and implement solutions. We want to work with and for you, because personal problems need and deserve personal solutions. After one year of having a filter, families report greatly improved health and fewer visits to the health clinic. Our current focus is in Rwanda. Sub-Saharan Africa is ranked as one of the world’s most underserved areas for access to clean water. Rwanda is a poor, rural country located in south-central Africa. With 80% of its population struggling to make it by with mainly subsistence agriculture, the 1994 genocide decimated their already fragile economic base. Today, though making strides to regain their economic stability, the population below the poverty line remains at nearly 45%. Specifically, we work along the Nyabarongo River, serving 7 rural sectors that use the river and adjacent swamps as their main water source. This district was selected as the initial place to begin our work in 2011 after a cholera outbreak killed nearly 500 people six years earlier. Though on the doorstep of the capital city, Maska is an underdeveloped rural area that was hit hard by the 1994 genocide. In 2013, we reached our goals in Masaka, by giving 15,710 people a decade or more of clean water through 1,082 slow-sand filters, 15 Rainwater Harvest Systems, and 7 SAM2 community filters. Ongoing visits to recipients attests that families are healthier and staying that way due to the constant clean water. Our certified volunteers from Masaka still help train new volunteers in neighboring districts. We first met with the local committee in April of 2013 and by June we had trained 32 volunteers and begun filter distributions. Today, 21,710 people have access to a decade or more of clean water in Gahanga thanks to 2,400 SAM3 filters, six SAM2 filters, and 13 rainwater harvest systems. But the numbers don’t begin to explain the difference these clean water solutions have made in the lives of those in Gahanga—people like Hadja or the 58 children at the Gahanga Home For Vulnerable Children. In early 2014, we entered our third district—Ntarama (pronounced Na-ra’-ma), an area inhabited by 11,581 people. Ntarama isn’t just hard to pronounce. It also epitomizes an extremely hard life on all fronts. This sector was especially impacted by the 1994 genocide with a disproportionately high death toll—around 5,000 people. Add to the mental trauma is the dirty, nasty Nyabarongo serving as the primary water source. By June of 2015 we distributed SAM3 filters to 1,545 families (7,670 individuals). But that’s not all, we also provided 9 Rainwater Harvest Systems and 6 SAM2 filters reaching a grand total of 15,125 people with a decade or more of clean water. When we entered Mwogo Sector in March of 2015, we found muddier swamps, slimier water and a high prevalence of stomach worms. We had to step up our technical game, refining our filters and trying new approaches to combat the worst water we'd ever seen. 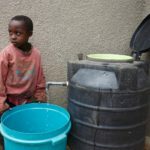 No challenge slows us down for long and by May of 2016, we had hit our targets, reaching 17,500 people through a combination of 1,620 SAM3 household filters, 14 rainwater harvesting systems, and 8 community filters. We get a great amount of satisfaction when we hear mothers reporting that their children no longer have worms. Juru is a large sector of more than 23,000 people. We started meeting with local leaders in February of 2016 to plan our work. Like other districts, subsistence farming is how men and women feed themselves and their families, most trapped in a generational cycle of poverty. Our volunteer crew believed not only could they improve their community's health, they could also increase days spent at work and school instead of home sick. We liked their attitudes and their speed. By February of 2017, we had distributed 1,653 SAM3 filters, 15 rainwater harvesting systems, and 7 SAM2 community filters. Our total reach in Juru exceeds 18,565 people who won't have to worry about dirty water for the next 10 years. In 2017, we launched a new plan that includes the Gashora sector. Now 2 hours away from home base in the capital, Kigali, we rely even more on our local leaders and volunteers. In March the community hosted a Walk for Water to raise awareness for the water project in the sector. Over 1,000 people attended, including our 43 new volunteers who are getting trained right now to help us reach our target of 3,210 SAM3 household filters, 13 rainwater harvesting systems, and 8 community filters to bring clean water to 25,750 people. Rilima is a victim of Rwanda's progress. In 2015 the Rwandan government began implementing plans to build a new airport complex in one of the only populated regions of the sector, displacing 6,000 residents. The remaining population are left without the community infrastructure they relied upon and are struggling for survival. Our 2017 plan brings hope to those remaining in Rilima. By September of 2018, we will have provided 604 SAM3 household filters, 5 rainwater harvesting systems, and 2 SAM2 community filters, giving 6,320 people a decade of clean water. Solving a problem starts with trying to understand the problem, which is why our programs in both Rwanda and the U.S. start with education. Our next step is getting hands engaged in making solutions. Once you’ve put your hands to work, the problem becomes your problem. You want to do MORE and need the tools to become an advocate. In Rwanda, the families receiving filters dedicate several hours participating in hands-on training to educate themselves about how to use and maintain their filter, how to avoid contaminating their filtered water, and the basics of preventing transmission of germs through hand-washing and hygiene skills. In the U.S., 20 Liters provides opportunities for families to learn more about the global water crisis and our technologies. At each of our events, we make demonstration filters available so that our supporters can touch and begin to understand how the filters work. We regularly suggest engagement activities like participating in a Walk for Water ... Read More that help individuals and families better understand the realities of living in a place without access to clean water. And finally, we make sure our supporters see the numbers that show the severity of the global water crisis and the stories of individuals who use our solutions to meet the needs of their families and communities. In Rwanda, our volunteers start by identifying the families in their communities who face the most barriers to accessing clean water. Then they work with their hands to build Rain Water Harvest Systems, install SAM2 Community Filters, and to complete final assembly and distribution of SAM3 Household Filters. In the U.S., our volunteers also have opportunities to get hands-on to make dirty water clean. They volunteer their time to host educational events, such as a local Walk for Water. They also complete the initial assembly of components for SAM2 Community Filters and SAM3 Household Filters that can then be shipped to Rwanda for final assembly. In Rwanda, our volunteers stay involved for years in their local communities by being on-call to help their neighbors maintain and repair any filters that experience issues. These volunteers-turned-advocates stay in touch with our program staff in Rwanda to make sure that our efforts are truly sustainable and to continue to advocate for the needs of their communities. In the U.S., our volunteers often share their passion for clean water on social media or plan local events to advocate on behalf of everyone who needs clean water and encourage their families, friends and communities to join them in taking it personally. These advocates can also harness their passion to sustain the work of 20 Liters financially by hosting personal fundraisers. SAM2s are large-capacity sand-and-membrane filters, providing clean water to 400 people a day. Primarily installed in health clinics or schools, these filters allow visitors to health clinics to take their medicine with clean water and bring a full container home with them. Being able to get clean water in the classroom means children don't have to miss school to fetch water. They can simply bring it home with them. A SAM2 requires no electricity or fuel and has no moving parts, making it the ideal solution for rural areas. Each school and clinic is trained how to use and maintain the filter, empowering them to be self-sufficient and address their own needs. Our SAM2 Filter costs $2,000 and lasts 10+ years. SAM3 (Sand And Membrane) filters are smaller versions of the SAM2 and are placed in households for a family and their neighbors. A SAM3 meets the World Health Organization's standards and requires no electricity to function, making it ideal for the rural sectors where we work. Each household is taught how to use their filter and given the phone number of a local volunteer to call if they have any issues. Volunteers are also assigned to visit each family to make sure the families feel comfortable using their filter and the health and hygiene training they received. Our SAM3 Filter costs $100 and lasts 10+ years. Rwanda is not the dry, desert-like area you might assume. Rwanda has long rainy seasons that provide 40 to 50 inches of rain a year—and it only takes 5 inches of rain to fill our 10,000-liter cistern. We place these tanks at centrally-located churches, which often reduce the time spent traveling to collect water from other sources. Churches sell the water at an affordable rate and use the income to maintain the system. Remaining funds are given to the poorest members of the community for school fees, uniforms, and other unaffordable costs. Slow Sand filters, often referred to as bio-sand filters are a common filter solution, widely used over the last century. Our 150-liter model generates enough clean water that two families can easily share the filter. Utilizing gravel, sand, brass, and a layer of good bacteria living on top, this filter actually works best when the water source is the worst. We use these filters in places where the water is so muddy and foul that no other filter could handle it. Each household is taught how to use their filter and given the phone number of a local volunteer to call if they have any issues. Volunteers are also assigned to visit each family to make sure the families feel comfortable using their filter and the health and hygiene training they received. In partnership with Village Water Filters, we assemble thousands of VF100 Home Filters every year. These simple, low-cost filters are an economical solution for developing countries, generating safe drinking water for just pennies a day. Utilizing the same filtration technology as our SAM3 unit, these units are ideal for clear-but-not-clean water sources and have the same 10-year+ lifespan while still exceeding EPA standards for bacteria and protozoa removal. In partnership with Village Water Filters, we build large-scale filtration systems that work in a variety of settings. Two large 0.1-micron absolute filters generate more than 10,000 liters per day while requiring very little maintenance. A simple to maintain pre-filter means these systems are perfect for clear-but-not-clean water scenarios. An adaptable unit that can mount to any flat surface means this filter is great for schools, hospitals, and commercial buildings. Training local people to implement the solutions empowers them to lead and make the program sustainable. Patrice has been a key volunteer since 2011.